Today has been a combination of mixed emotions - It was Kieran's graduation day at Nursery, which meant there was a presentation at the High School where all the little kids got given a certificate and all the work that they have done over the past year to take home - A time to celebrate all they have achieved in the past year... 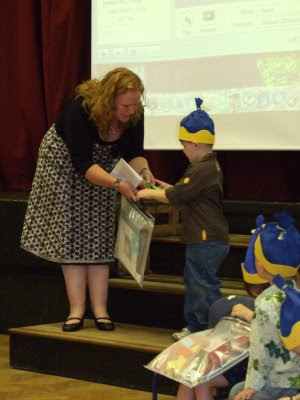 Sadly though, it was also Kieran's very last day at Nursery School. Michelle had another visit to Cheltenham Hospital today. It is so painful for her to walk, she has now been given crutches. Michelle is now 34 weeks and 1 day pregnant. She had a scan today and found out the following. Although technically we should still have at least 6 more weeks, the hospital have told Michelle that if she has not had the twins by 38 weeks, then she would be induced. Mind you, the midwife seemed pretty sure that Michelle would have had them by then.